What’s inside the Rage Anarchy Edition? You know a title is ready for release when they stop telling you about how the development is going and start telling you about the awesome limited edition titles that they are offering. At first glance the Rage Anarchy Edition looks to be an awesome edition to pick up with the Crimson Elite action figure, RC car, model shotgun and some awesome fighting gear. 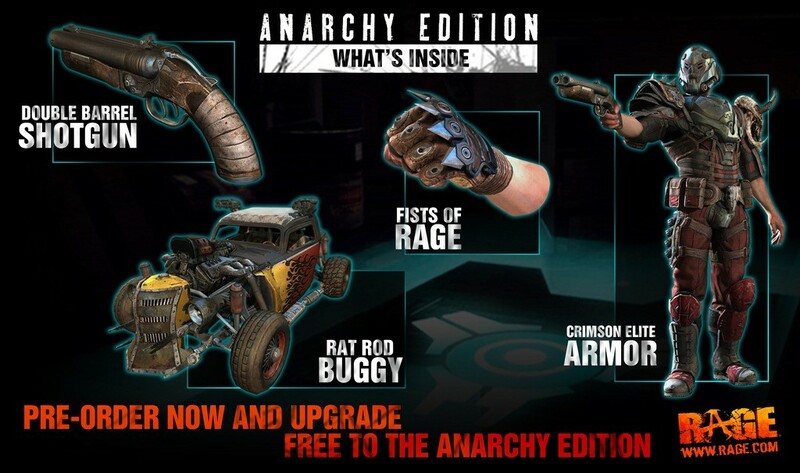 Unfortunately on closer inspection it was revealed that while it is true that the Anarchy Edition will ship with a double barrel shotgun, fists of Rage, Crimson Elite armour and a Rat Rod buggy none of these items are physically tangible. But rather they are all virtual items you will receive when ordering the Anarchy Edition, but yes I still want that Rat Rod. In the PR email’s own words this is what you are going to be receiving. Wasteland settler design and ingenuity!Â Features compact form factor with plenty of muscle to take out everything from mutants, bandits and maybe even a lone Authority Enforcer. This is the most sought-after armour in the wasteland. Constructed of hardened plate armour, this gear was created specifically to withstand the toughest wasteland battles. It also features larger component storage, allowing you to carry more parts that will aid in the fabrication of advanced engineering items. A classic weapon for close quarters combat.Â When you’ve run out of ammunition and fists are the only option, these razor sharp knuckle blades will give you that combat edge.